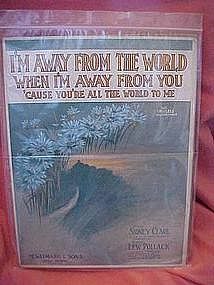 Nice old sheet music selection by Sidney Clare and Lew Pollack. Titled "I'm away from the world when I'm away from you 'cause you're all the world to me. Standard size, dated 1921. Nice condition, all intact and has small minor corner bends.